It was milestone Monday for Facebook, as 1 billion people used the social network in a single day for the first time ever. We just passed an important milestone. 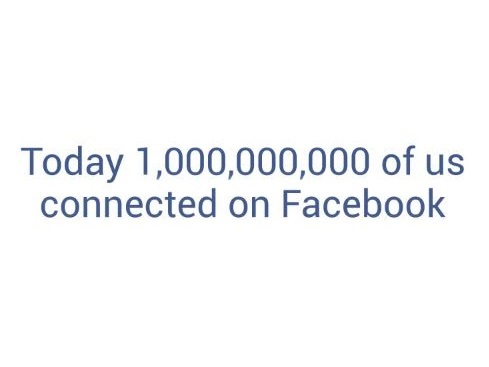 For the first time ever, 1 billion people used Facebook in a single day. On Monday, one in seven people on Earth used Facebook to connect with their friends and family. A more open and connected world is a better world. It brings stronger relationships with those you love, a stronger economy with more opportunities and a stronger society that reflects all of our values. This week, we passed a pretty major milestone: For the first time ever, 1 billion people visited Facebook in a single day. Dustin always used to say that this day would come, and that it would happen sooner than anyone thought. I will confess that I thought he was crazy at the time, or at least that his imagination was bigger than mine. Readers: Did you think Facebook would ever reach 1 billion visitors in a single day?